Modeling and decision-making require the most time and thought. N1QL gives you the flexibility to transform from scattered relational data into an aggregate-oriented document model. Next, we must decide whether JSON data modeling design is appropriate (I don't think it is — as if the bucket being called "staging" didn't already give that away). Note that InvoiceId is no longer present in the objects in the Items array. This data is no longer foreign — it’s now domestic — so that field is not necessary anymore. A user usually views the entire invoice (including the invoice items). When a user creates an invoice (or makes changes), they are updating both the “root” fields and the “items” together. There are some queries (but not many) in the system that only care about the invoice root data and ignore the “items” fields. The relationship is 1-to-many (a single invoice has many items). Data reads are mostly parent + child fields together. Now that we've done some JSON data modeling exercises, it's time to transform the data in the staging bucket from separate documents that came directly from the relational database to the nested object design. There are many approaches to this, but I'm going to keep it very simple and use Couchbase's powerful N1QL language to run SQL queries on JSON data. First, create an “operation” bucket. I’m going to transform data and move it to from the “staging” bucket (containing the direct CSV import) to the “operation” bucket. Next, I’m going to mark the ‘root’ documents with a “type” field. This is a way to mark documents as being of a certain type and will come in handy later. Once you’ve verified that this looks correct, the data can be moved over to the “operation” bucket using an INSERT command, which will just be a slight variation on the above SELECT command. INSERT will always use KEY and VALUE. You don’t list all the fields in this clause like you would in a relational database. META(i).id is a way of accessing a document’s key. FOR i specifies the left-hand side of the ON KEY join. This syntax is probably the most non-standard portion of N1QL, but the next major release of Couchbase Server will include “ANSI JOIN” functionality that will be a lot more natural to read and write. 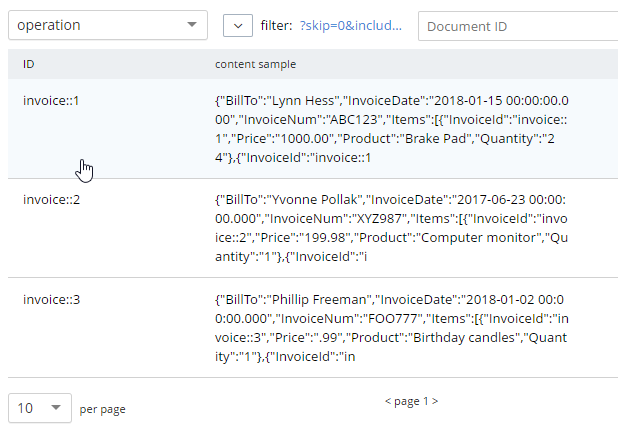 After running this query, you should have three total documents in your operation bucket, representing three invoices. Part of the SQL Server series discusses the same type of JSON data modeling decisions. How Couchbase Beats Oracle, if you’re considering moving some of your data away from Oracle. Feel free to contact me if you have any questions or need help. I'm @mgroves on Twitter. You can also ask questions on the Couchbase Forums. There are N1QL experts there who are very responsive and can help you write the N1QL to accommodate your JSON data modeling.